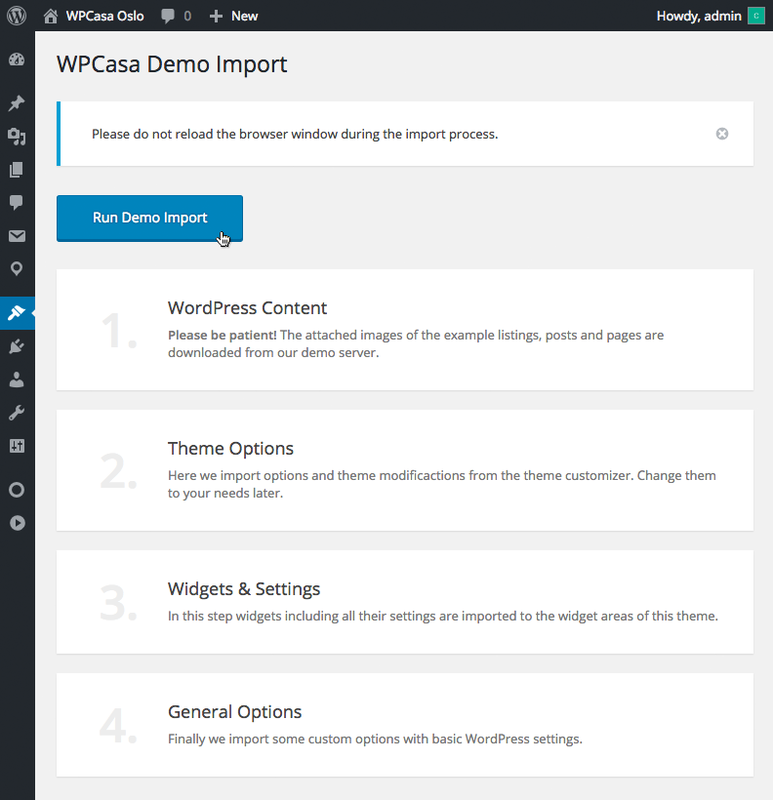 When you install the WPCasa Oslo theme on a fresh WordPress installation there will be no theme-related content. A great way to learn more about the power of the theme with all it’s features is installing some demo content. With our new one-click importer you can import the entire content of the theme demo into your installation by simply clicking a button. Technically the demo content includes pages, posts and listings, widgets (and their settings) and some other options (like the static front page etc.). In order tu run the import process please go to WP-Admin > Appearance > Demo Import. The demo importer makes use of some plugins that we need to install in order to run the process. If these plugins are not installed and activated on your site, you will see the notice with a list of the missing plugins. By far the easiest way to install the plugins is using the plugin installer on WP-Admin > Appearance > Install Plugins. Please also see Installing WPCasa Oslo. To use the importer please install the necessary plugins. Once the demo importer has all the tools he need go to WP-Admin > Appearance > Demo Import. If you don’t see any message about missing plugins, we are read to go. By clicking the big blue Run Demo Import button you can finally start the import process. Important! Please keep in mind that the demo also includes a few images. Depending on your internet connection this process can take a while (a few minutes). Please be patient and do not close the browser window or tab. Especially step 1. WordPress Content will take a little longer as the demo images will be downloaded from our servers. When the import is complete all the steps will be marked green. You can visit the front end of your site to see the results. Browse through the pages and get a feeling of how things works. If you have problems with Page not found errors, please save your permalink settings on WP-Admin > Settings > Permalinks. We also recommend to have a look at the backend. Especially the static pages and their settings on WP-Admin > Pages and the use of widget areas, widgets and their settings on WP-Admin > Appearance > Widget might be insteresting. To become familiar with the theme create a new static page yourself or move the widgets around to see how they behave. When you are done with your testing you might want to remove or edit the content of the demo listings, pages and posts. Another option is to start over with a new fresh WordPress install and add your own content from scratch. Also, if something goes wrong during the import process (internet connection is interrupted or something) and the import could not complete successfully, the easiest way to restart is resetting the WordPress installation. The plugin WordPress Reset is a very useful tool.